Gareth Delve made his Wales debut in 2006 against Scotland having come to the attention of the selectors with a series of strong showings for Bath. Born and raised in Cardiff, Delve accepted a scholarship to Colston's Collegiate School in Bristol before alerting the interests of Bath and signing a contract in 2001. Delve initially struggled for game time but his imposing power game, seen more often than not at No.8, made him an attractive proposition. He remained on the periphery of the Wales side following a switch to Gloucester, but was part of the squad that won a Six Nations Grand Slam in 2008. Later that year he made his first start, against South Africa in Pretoria, but suffered a knee injury that would rule him out of the start of Gloucester's season. It also marked the start of a spell in the international wildnerness which only came to an end two years later when Delve was selected at No.8 for Wales' Six Nations clash with Ireland in Dublin. Warren Gatland's side were beaten at Croke Park and Delve was dropped to the bench for the following weekend's encounter with Italy. Shortly after the end of the Championship, Delve announced that he would be leaving Gloucester, whom he had captained for two years, to join the newly-formed Melbourne Rebels. Delve penned a two-year contract with the Australian outfit and became the first Welshman to play in the Super Rugby series. Midway through his second season with the Rebels he signed a contract extension, committing himself to another season in Super Rugby. 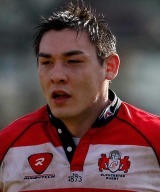 Wales international Gareth Delve will lead Melbourne in 2013.